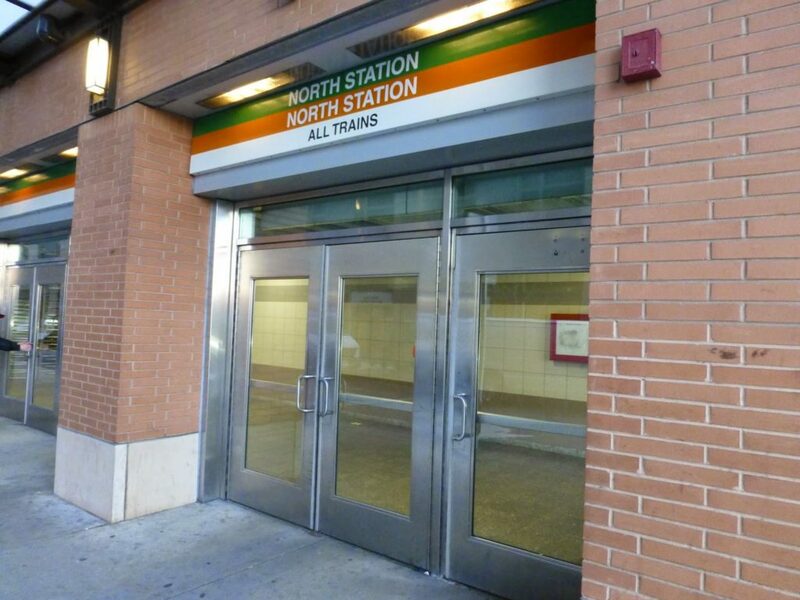 If South Station is the king of MBTA stations, then North Station is most certainly the queen. (Back Bay is like the 6 of hearts or something.) This massive complex features 10 tracks, serving both the Commuter Rail and Amtrak Downeaster to Maine; an underground “superstation” for the Green and Orange Lines; a huge underground parking lot; and a direct connection to one of the most important sports venues in Boston. There’s quite a lot to talk about, so let’s get right to it. When you get off a Commuter Rail train, you’re forced to move along with the current. This picture was taken in a hurry. 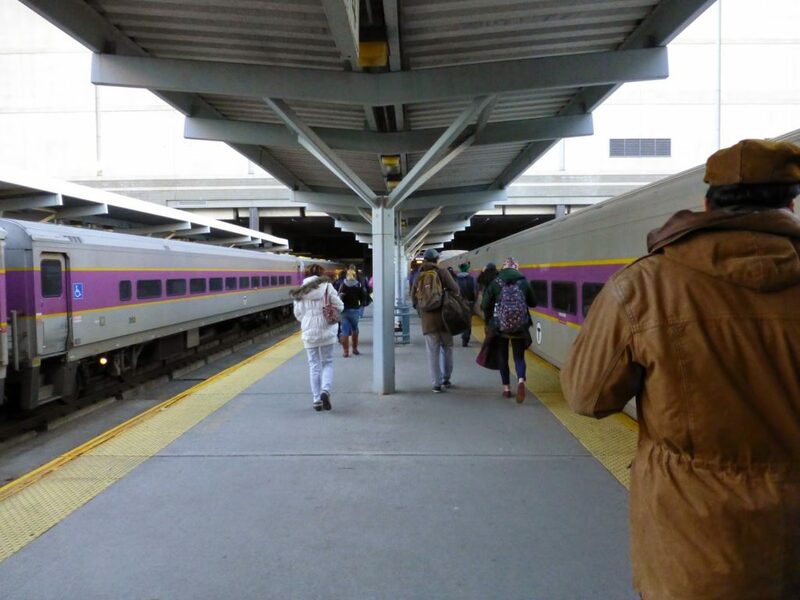 The Commuter Rail platforms are very simple, but that doesn’t matter – nobody waits on them. They’re all high floor, with a simple shelter providing basic protection from the elements. One end of it is entirely sheltered, but again, nobody waits on the platforms. A portion of the huge waiting room. There’s always a lot of energy in the waiting area. For one thing, there’s its huge size, and the fact that there are a million people going every which way to various platforms. The area also has some restaurants and lots of benches. Plus, there are the departure boards. You gotta love the departure boards. From the waiting area, there’s a bright hallway that goes down the length of the building. It connects the east and west entrances, and has various ticket offices along it. 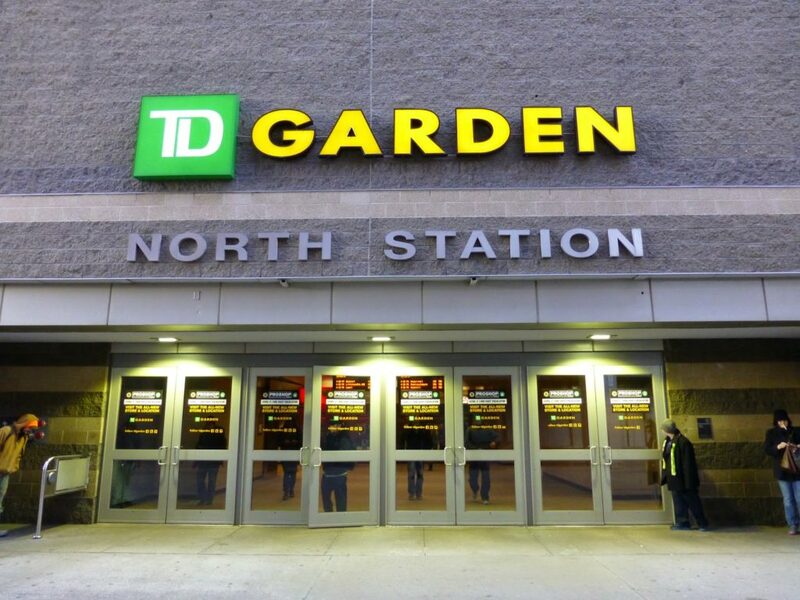 There’s also a direct connection to TD Banknorth Garden from here, as well as elevators down to the underground parking garage (offering 1,275 spaces). The west entrance of the building is, obviously, on the west side of the building. It leads to a pedestrian walkway, with one end leading toward Causeway Street and the other going to Nashua Street. To get to the latter, you have to walk through a lengthy construction walkway. Also, Nashua Street is where the E-Z Ride bus boards to Lechmere, Kendall Square, and Cambridgeport. To the east is – Surprise! – the east entrance. This entrance leads to a road which goes back to Causeway Street. It also leads to both the subway entrance and the 4’s bus stop. Something I like about both the entrances is that they have mini departure boards just inside. That way you know if you should be running for your train or not. The subway has a pretty modern entrance on this side. It’s a long headhouse, with a sloping roof that tapers off at one end. 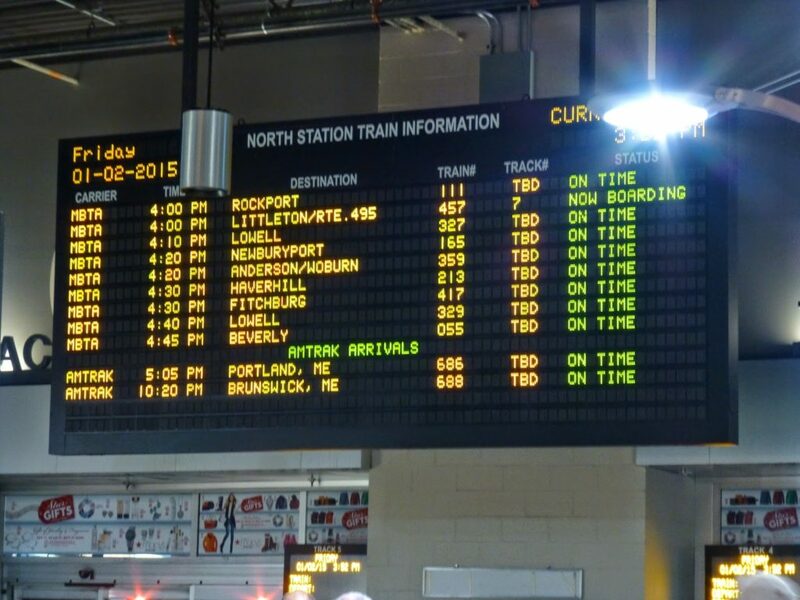 My only problem is the fact that it’s not connected to North Station proper. Having to walk out to get to the subway can be annoying, especially when it’s freezing, like when I was there. The entrance on Haverhill Street. There’s another entrance on Haverhill Street, within a modern building. This one has a simple lobby and stairs down to the mezzanine. It connects with the main entrance there, which comes to the mezzanine via a hallway still decked out in a holiday advertisement. The station has a third entrance on Valenti Way, but I didn’t have time to see it on my trip. The mezzanine is simply huge. It has so many fare gates and so many fare machines that it’s clear it’s meant to shuttle lots of people through. Indeed, I had to wait at least a few minutes to get the above, somewhat empty shot. There’s one of those creepy security camera booths here, too, the kind with the tinted windows that takes up half the room. Click on the picture to make it bigger. This shows the amazingly easy transfer. And then the mezzanine descends down to the best transfer on the entire system. It’s too bad they got rid of the Green Line EL that used to be here, but this transfer is worth it. On the inbound side, it’s cross-platform, meaning the Green and Orange Lines are accessed from the same one! It’s so easy! And if I’m heading down to the Red Line from here, I can just take whatever comes first! I love it! And the outbound sides are easily accessed by another level above the platforms, so even those transfers are easy. I have to brave the transfers of death at State and Downtown Crossing too much, so this station is a breath of fresh air. It’s just the best. One of the Green Line platforms. The Green Line platforms are pretty nice and modern. They’re stacked on top of each other, but pretty much the same in terms of appearance. I really like the wall and how it curves up to become the roof. There were a few spots with chipping paint, but overall this platform is great. 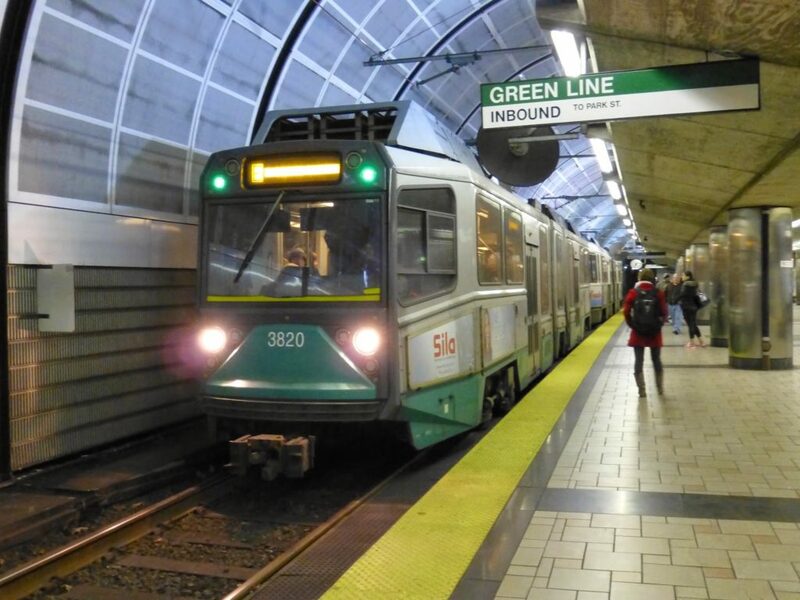 The only problem with it is that it’s much longer than the Green Line trains themselves. Make sure you know where to board, or the train could stop much further from where you were standing. A train at the station. 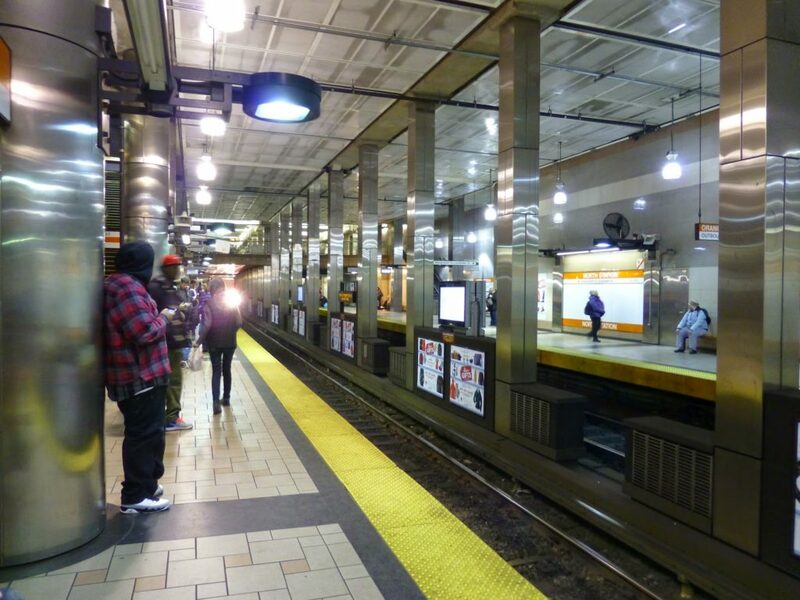 The Orange Line platforms are more standard in layout – they’re just two side platforms. They’re also quite modern, with cool reflective pillars lining them. It’s very well-lit (though my camera didn’t agree and decided to take blurry pictures) and the ceilings are quite high. Plus, from the Forest Hills platform, you can get right to the inbound Green Line! Yes! Kind of artsy, I guess. Ridership: Oh, it’s a doozy. 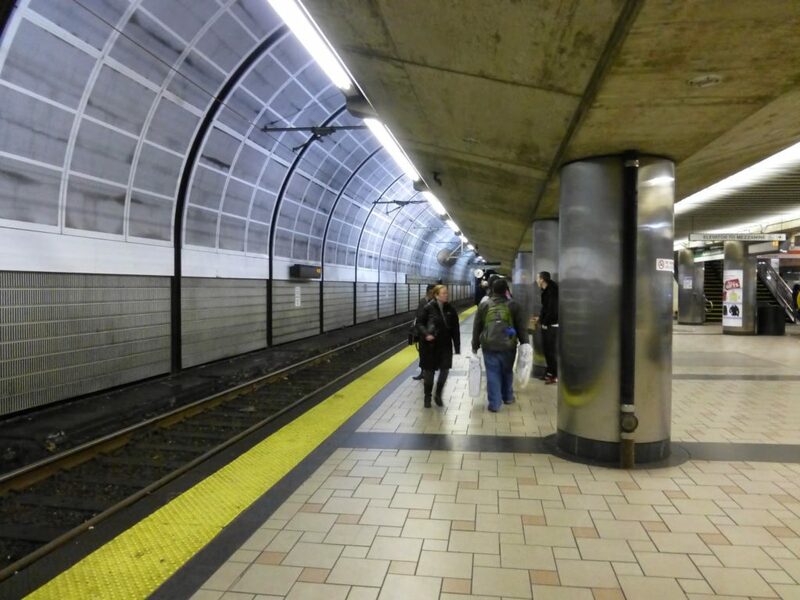 This is the sixth-busiest MBTA subway station, with over 17,000 riders per weekday! The Commuter Rail’s ridership isn’t in the MBTA Blue Book, but I know that it’s quite heavy. TD Garden is also a big ridership draw, and there are probably some people that head to the North End from here (though Haymarket is generally closer). Pros: Thanks to the recent renovations, this station is very clean and modern. 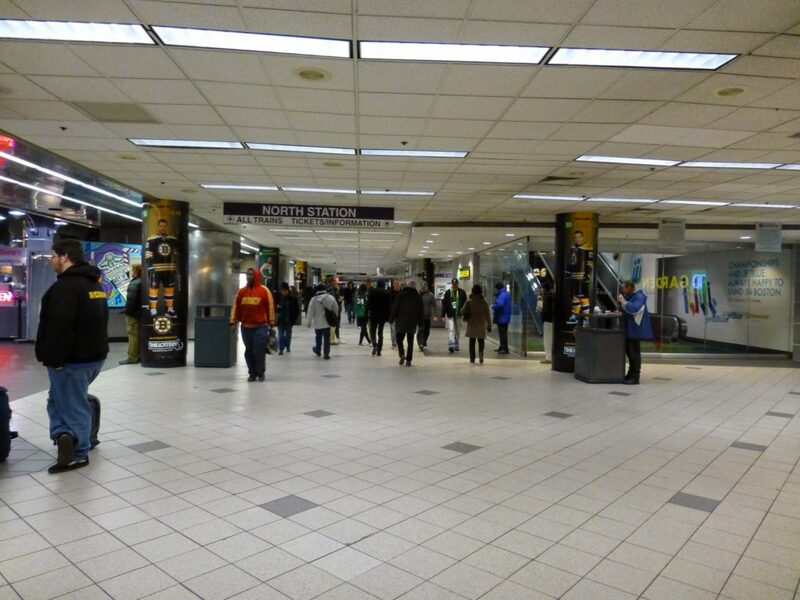 Aesthetically, I don’t think there are any aspects of North Station that I don’t like. 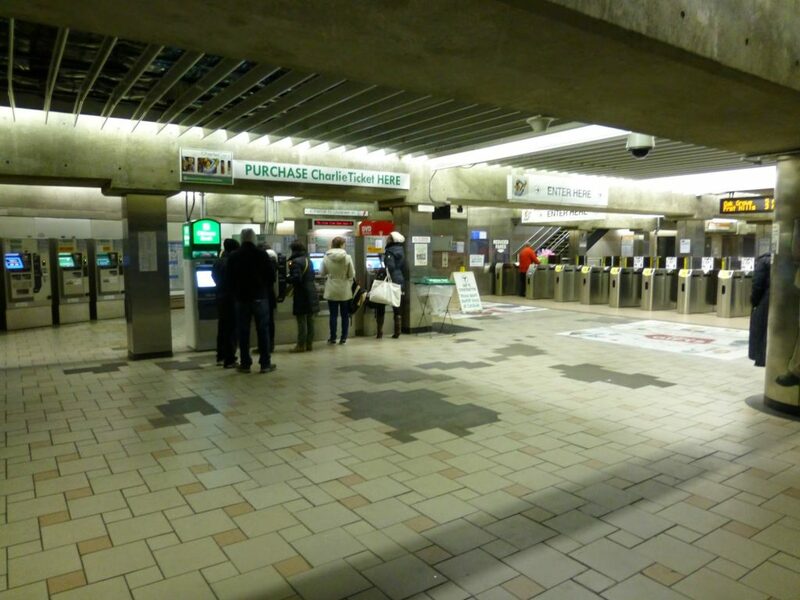 The direct connection to TD Garden from the Commuter Rail station is great, and the underground parking lot is huge. And we can’t forget about that amazing cross-platform transfer in the subway station. Cons: My only major issue here is that there’s no underground connection between the Commuter Rail and the subway. Granted, this would be expensive to implement, and the current walk isn’t that long anyway. Nearby and Noteworthy: The TD Garden, obviously. Also, for an really cool view, head up to Portal Park, just to the east of the Garden. You can look right up the Zakim Bridge, as seen in this photo. It’s definitely worth a look, and watching all those cars speeding by is hypnotic. This station is great. I love everything about it aesthetically – apart from a few very minor paint chippings, this is a beautiful hub. The only thing I really don’t like about this station is the lack of an underground or sheltered walkway between the subway and the Commuter Rail. But honestly, that cross-platform transfer is what makes this station. This is the best transfer station on the system, I’ll tell you that much. UPDATE 1/6/19: There is now an underground passageway to the Commuter Rail here! Check out my post about it here. The station now gets a perfect 10/10. The guy that jumped over the Red Line tracks at Park Street has been all over the news lately. The MBTA may charge him for trespassing. Just want to say Happy 2nd Anniversary of your blog! 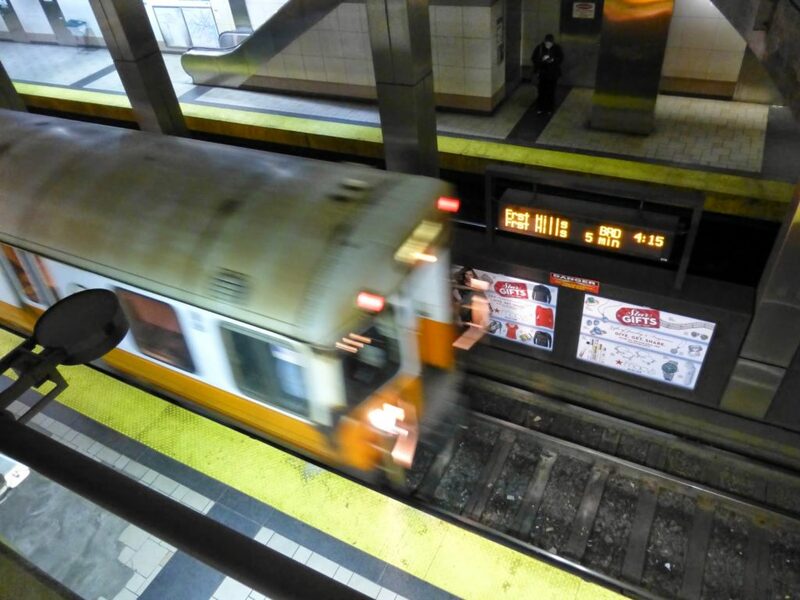 I hope you continue to find joy writing about public transportation for at least a few more years This is the best blog about the MBTA. I heard a rumor it's your birthday. Happy birthday! Glad to see you're still blogging, and doing a fine with job with it — the 6 of Hearts is a great joke. Let me know when you do Savin Hill. Thanks, guys! I've learned all my writing skills from you. 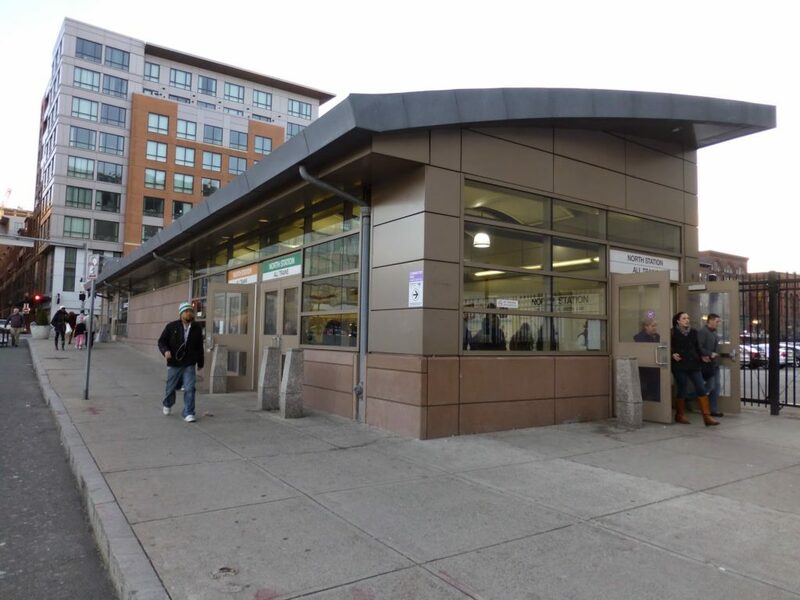 There were plans to locate the commute rail station further back and make the current head house location an inside entrance, but somewhere along the line the T gave up the rights to that property. Really? Was this when they renovated the station? They are finnaly putting in a passage way to connect the subway directly to the commuter rail. You can change the rating to 10/10. 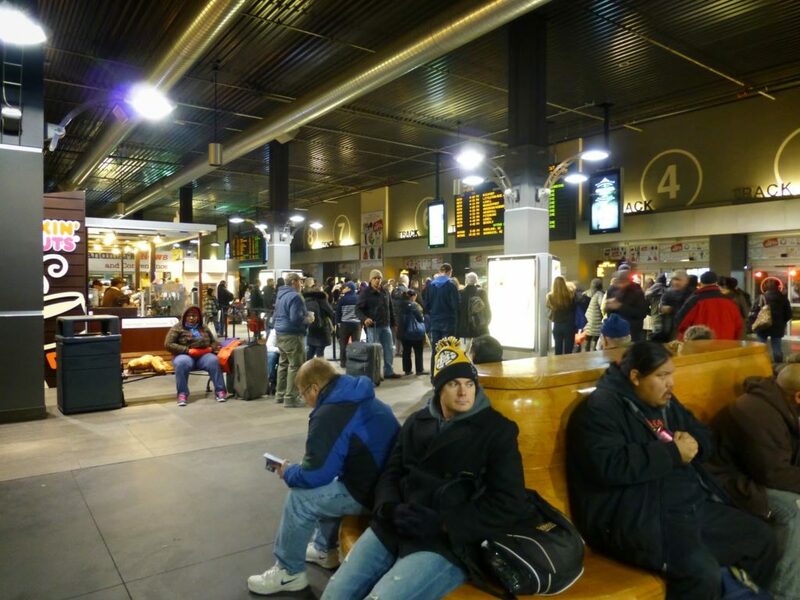 North Station has seen many changes over the years. At one time, commuters had to cross under the elevated at Causeway St. and then hope a Green Line trolley was waiting at Canal St. If it wasn't, you could press your luck by climbing a set of stairs and walking a considerable distance to get to the elevated North Station platform. If you were lucky, a train coming from Science Park would arrive. If you weren't lucky, you'd see that train pass by before you had a chance to reach the platform. I don't miss that configuration at all.